There are certain items in my closet that consistently stand the test of time. My bell bottom jeans are just one of those pieces. Whether it's a great shift dress or a blouse with belled sleeves, I love anything that's reminiscent of the '70s. Since I'm all about dressing up the basics, I decided to accessorize with turquoise statement jewelry and loose tousled hair. I hope everyone had a great weekend! That jewelry is gorgeous and I love the flare-leg jeans on you! Love your wide-legged jeans. You look so chic! You look absolutely stunning! 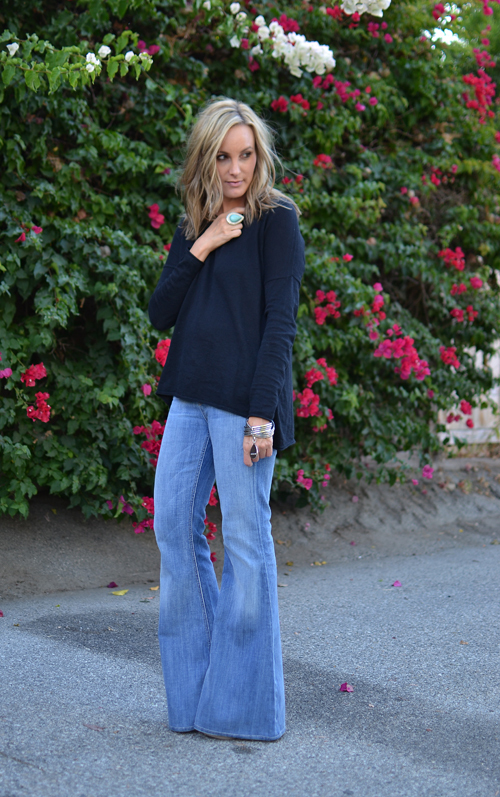 Navy is so you color and so are bell bottom jeans, so so good! Love these pants! I have to ask: when you were pregnant, did you continue wearing your normal pants and just use a belly band? Hi Lins! I swore by the Bella Band while I was pregnant. I did wear a lot of my regular pants but I also had a few great pairs of maternity jeans. SO AWESOME. i am so glad to know i'm not the only one who loveeees bell bottoms!! Simply gorgeous Audrey. Love the jewelry. So lovely! 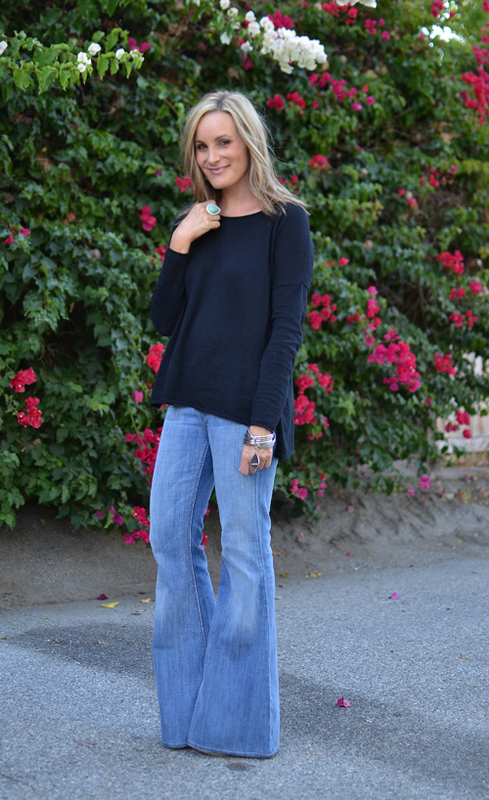 I'm also gravitate towards bell bottoms every now and again. I love the flare-leg jeans on you! The ring and the earrings are gorgeous! Thank you for sharing. Amazing! I absolutely love this outfit! It’d be perfect for our weekly link-up. I’d love for you to stop by and link-up your blog! :) it’s a great way to gain exposure to your blog! Take care!